E:23 error on a BRAND NEW robot? This does not bode well. Please contact me immediately to resolve this error that appeared right out of the box! Sorry to hear that your robot has this issue. Please contact customer service on the number in the application. They will make sure your robot gets new batteries. That is, unfortunately, the only way to get it working. I performed a reboot by pressing the play/pause button while the robot is in the charging base for about 8 seconds until it went all dark, then after a couple of minutes I pressed the play/pause button again and it now displays only the red battery pulsing and the time is blank because - due to the lack of battery power, I haven’t yet been able to set it up on WiFi. I appreciate your quick response and will call the service number for replacement batteries this morning! @MartinKwarnmark Thank you for your work, MartinKwarnmark! I am expecting a confirmation email today for: 2 replacement batteries quickly shipped along with a 1-month warranty extension for loss of use on a brand new product due to manufacturing defect. The telephone number on the app works, but is never answered by a human so you must leave a voicemail. 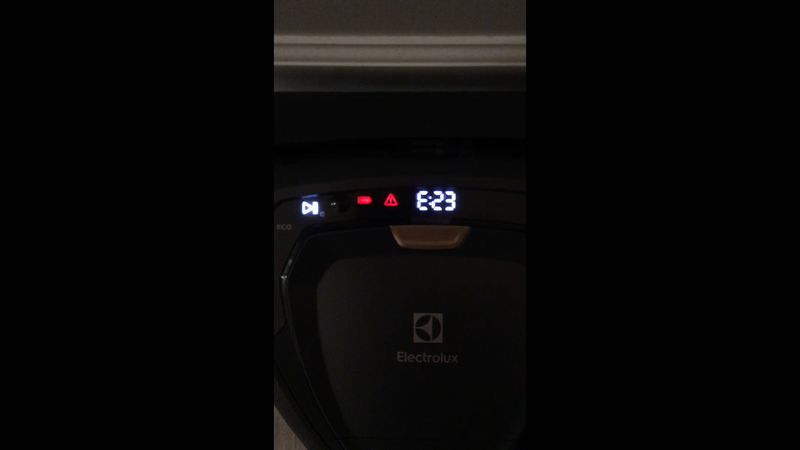 That leaves much room for improvement since ElectroLUX wants to be a luxury or shall we say upper echelon appliance brand and it just doesn't look good to have to use voicemail in 2019. Still, it wouldn't be a huge deal necessarily - except for the fact that the nice gentleman who responds to those voicemails said that those voicemails (after the "...thank you or calling Electrolux..." introduction) are apparently routed to Anova Culinary (congratulations on the Anova Culinary acquisition) but that he "will forward the information to Pure i9 support". So, clearly there are some bugs left to be worked out in your support system. That does partially explain why the shipping came from Anova Culinary and not from "Electrolux Pure i9" or similar. Bottom line is you folks are doing a great job, you're on the right track in so many aspects ; it's just the finer details that need to be ironed out, so-to-speak. Impression is that you are doing a great job, Martin and team! Thanks again. Martin, do you have any influence on your company's service department to get this issue resolved or should I just give up, get a refund and order a Roomba i7? Please pleeeeaaasssee tell me there is hope and that Electrolux will come through, make it right with this customer and not disappoint! I have heard rumors that we have a shortage of cells in some places of the world. There is hopefully a solution where there could be batteries in another market that could be shipped to you. Support offered to refund, so I accepted 😕. They emailed me a return label and it should arrive back in Stafford, TX soon. I now have to get another one. Amazon price is more and fluctuates frequently but I think that’s what I may have to do to get it, though I already sent them one back because they wouldn’t price match 😂. So this will be my THIRD Pure i9! I’m an expert at unboxing them now.